Our breakfast in Tsavo (Tsavo is where the world’s largest elephant Satao was from and where he was killed by poachers only a short while ago) along the Galdessa River was prolonged when this big guy named, “Pembe Moja” (One Tusk), decided it wasn’t time for us to leave and – very calmly – blocked the exit. We weren’t expecting much action alongside our meal this morning so this image was quickly taken with my iPhone (so great for on-the-fly shots). 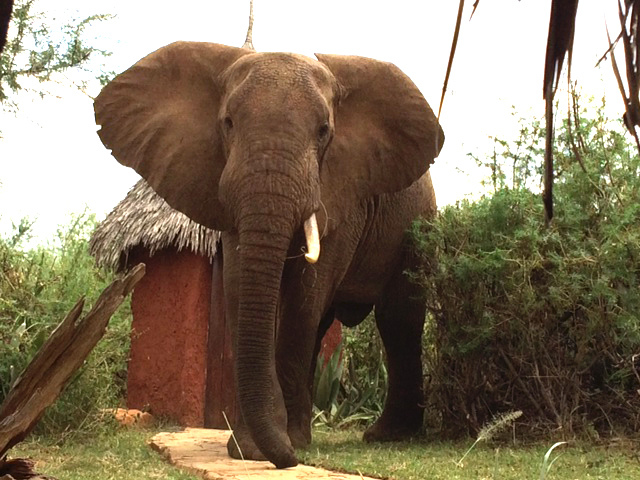 This young male elephant, 25-30 yrs approximately, loves to hang out at our Banda (Bandas are large tented rooms encased within a larger reed-and-thatch building under thatch). And we love him hanging out wherever he wants. TRAVELED SO FAR: Chyulu Hills, Samburu, Tsavo, and now the coast and Shimba Hills. More soon!